Rival Watch - Page 2 - Hob Nob Anyone? Meltdown on twitter for fans over Mike Ashley and Rafa's post-match interview. We're on our way back! And let's not get carried away Saturday either, we all know that Reading are more than capable of turning in a real **** of a performance at Portman Road. By the way is Huddersfield v Leeds on the TV at all this weekend, that would be a cracker of a game and so much more worthwhile to show than the usual turgid PL cr@p SKY continually chuck our way. Thought not. They're still in a great position, and if they do choke, with the squad they've got and the money they've spent, they should be angry at Rafa, not Ashley. Pepe the Horseman They're still in a great position, and if they do choke, with the squad they've got and the money they've spent, they should be angry at Rafa, not Ashley. Why would anyone not be angry with Mike Ashley ? Their games in hand are surely on the 18th when we aren't playing due to Huddersfield still being in the cup. 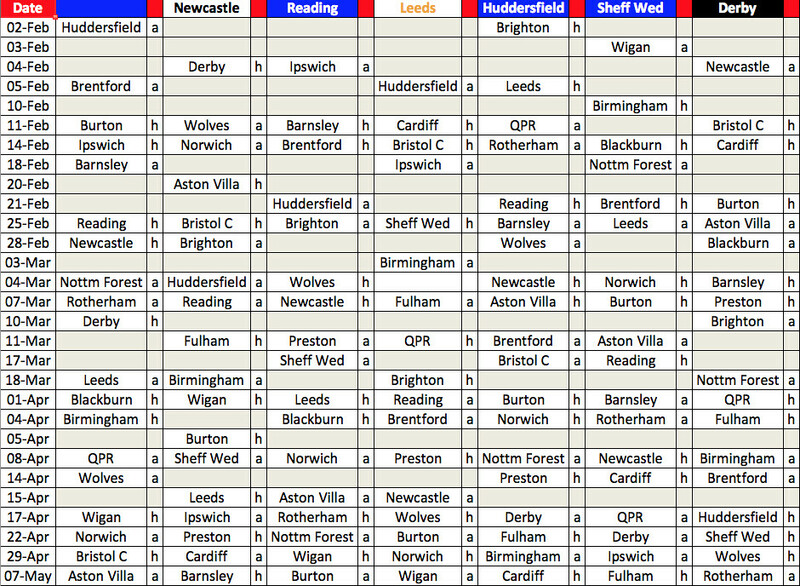 So Brighton at Barnsley and Newcastle home to Villa on the 20th. Their game on the 28th will leave us with the Huddersfield game in hand, as our game there can't be played on the 28th as they are playing Wolves already. Huddersfield away will probably be 14th March. Royal_jimmy Huddersfield away will probably be 14th March. Nope, its Tuesday 21 February as expected. Newcastle have all 6 to play. Loving the look of our final run in! Hopefully a couple of those last 4 games we play may be against already relegated opposition. Stockport Royal Loving the look of our final run in! Yep, because that always ends well. Dominic Samuel scores the winner for Ipswich against Newcastle, we leap from them and close out the seasons with wins culminating at Burton..... I hope!! Huddersfield looking very good compared to Brighton who have barely featured. Lucky to be 1-1. Changed my mind and now want Huddersfield to win (as long as it's not by too much and gives their GD a boost) as Leeds and Huddersfield are playing each other on Sunday and can't both get points at the weekend too. Last edited by genome on 02 Feb 2017 20:22, edited 1 time in total.